A blender is a necessary appliance for any modern kitchen whether it’s for quick smoothie, post workout, puree, soup, etc. There are many different brands and models on the market ranging widely from below $40 to over several hundreds. Depend on your budget and needs, one might work better than the others. Here are our new and updated take on 10 best blenders for smoothies and all that are currently popular. 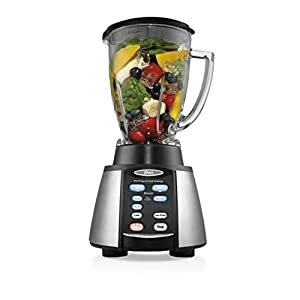 If you want the most powerful and efficiency blender on the market, the Vitamix Professional Series 750 kitchen blender is the top of the line for producing the smoothest smoothies ever for the whole house. 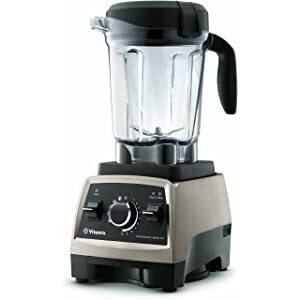 Offering a 2.2 HP motor that is shockingly quiet on the encapsulated larger 90oz, 64oz or 48oz jar, the Vitamix will do far more than just make a great smoothie. With intellectual design and blade’s movement, this incredible machine will completely mush even the toughest of vegetables, turning them into smooth, drinkable smoothie. The giant 64 ounce container will allow you to make smoothies for the whole family as well as hot soups, homemade ice cream, frozen desserts, whole-food juices, nut butters, and more. It is just so powerful and efficient that you don’t have to pre-chop ingredients, just throw them in the jar, filled to capacity and come out with the best smoothies. Peanut butter, not a problem, go ahead. Best of all, the Vitamix Professional 750 self-cleans in just 60 seconds when you are done and comes with a full 7 year manufacturer’s warranty. Now that’s a great blender. Beware though, the older version of Vitamix tend to shed Teflon while blending; this issue was fixed in its 2016 revision. Just watch for the manufacturing date when you’re buying. 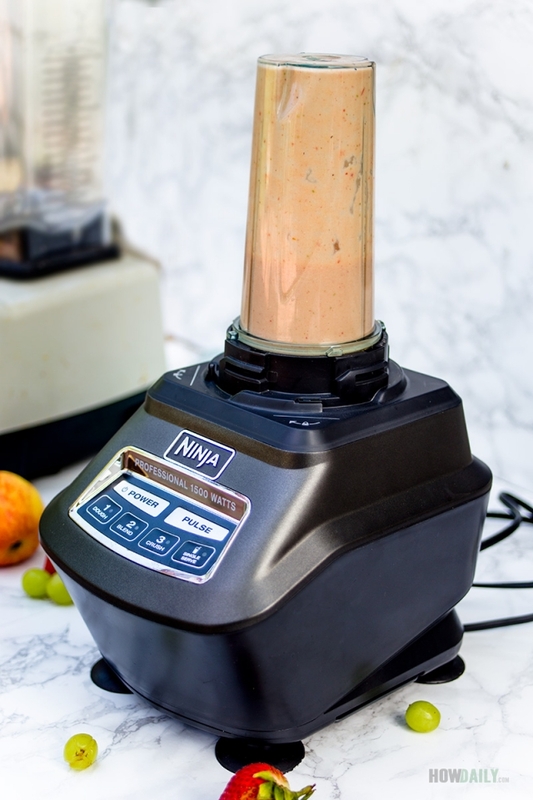 This is the strongest, most powerful motor blender on the market. The Blendtec Total Blender Classic is one of the most trusted names in manufacturing commercial blenders and also a frequent choice of many juice bars, coffee houses and smoothie shops around the world. Whip up a cake batter, crush ice, juice the heartiest of vegetables and make ice cream and soup with this versatile 10-speed blender with easy-to-read touch pad controls. There are just too many thing could do with their 6 available cycles for handling from smoothie to puree, soup, and etc. With the powerful 3 HP motor, this beast could blend through anything without the need for tamper in between. 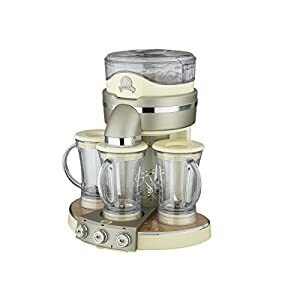 At 15.5 inches tall, the Blendtec fits easily under most kitchen cabinets and with its heavy base, the machine would sit nicely still through any blending vibration. All of those pros are back up with full 8 year manufacturer’s warranty. Flaw, you may ask? 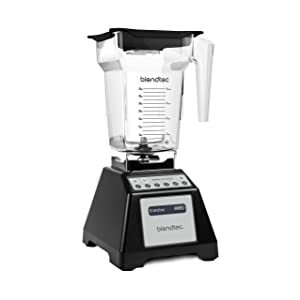 Apart from being on the pricier side (less than the Vitamix), some Blendtec owners might complain about the actual blend-able capacity. E.g despite being at 64oz, the carafe shouldn’t be filled more than half to function efficiently. So that leave 32 oz of smoothies, soup or whatever you’re blending, which if you have to serve 5 or more would present a tedious task. Another flaw, when comparing to the Vitamix, is that its uncleared accompanying user manual, which is kind of frustrate for newcomers. Unclear usual manual, unclear instruction, accompany recipes are worthless. 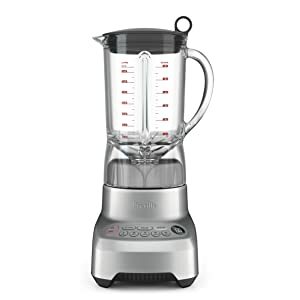 If most of the blender focus on smoothie and puree around the kitchen, this machine is truly the heart of any party. By having the ice shaving capability and blending large size batches at the touch of a button, your group party can enjoy bar quality drinks anytime. There are presets for 6 popular drinks and separate ice shaving function. With 3 carafe, you can make colada , margarita and smoothie all at once. Want a snow cone? Use the shaving only feature. Slushie or any other frozen treats can be achieve by tweaking around a little bit too. 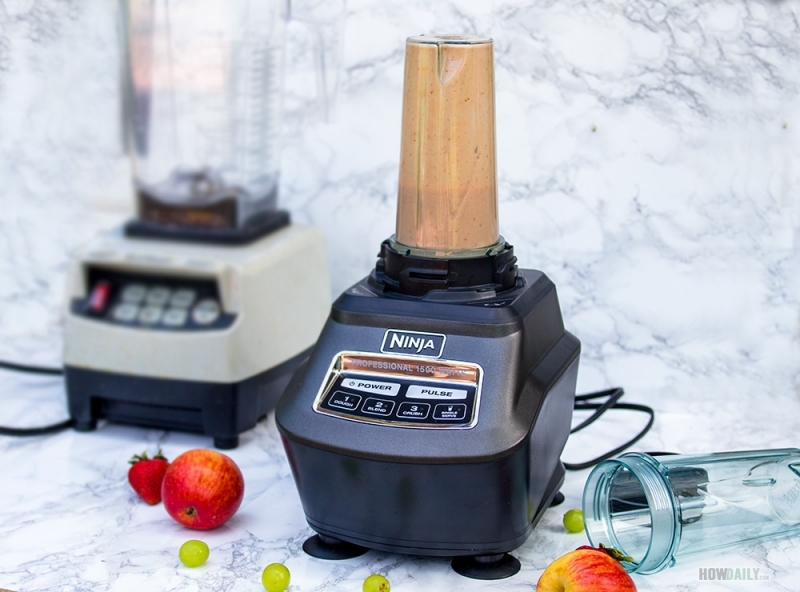 If you want an all-in-one appliance that combines a complete blending system with the versatility of a food processor, mini chopping bowl and to-go blender cups for smoothies and juices on-the-go, then the Ninja Mega Kitchen system is for you. The 2 HP motor offers you 1500 Watts of peak blending power and enough juice to pulverize even the sturdiest fruits and vegetables. When you’re ready to make bread, pie dough or cinnamon rolls, the food processing attachment with blade dough will make quick work of kneading the dough for you or chop up a batch of veggies for a stir fry. For smaller jobs like chopping onions or cilantro, throw in the 1 cup bowl to make quick work of all your dicing and chopping needs. The ninja also comes with several attachments like a double-sides shredder and slicer for even French-fries and cheese shredding. This is just perfect for daily use, you’ll get the most out of this. Choose from the giant 72 ounce blender jar for family gatherings or the individual smoothie cups to take with you. The single-serve cup are so useful, especially for the morning/post workout scenarios, just pop the blade in, blend for 2-3 seconds, replace with the sippy cap and you’re ready to enjoy. 5-minutes max quick smoothies. Cons, yes, with the variety of attachments and parts, you will end up with big box that would eventually cost a whole cabinet space. If you’re blessed with a large kitchen, this won’t be a problem, otherwise running for storage space might be frustrating, as all parts are loosen, uneven, and do not stack. Multi-function options, blending, food processing, single-serve, shredding, slicing, etc. 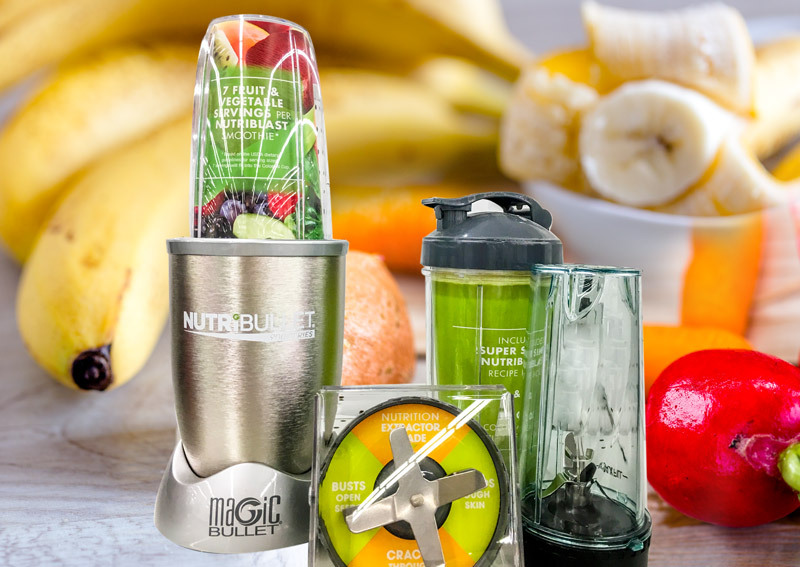 Offering only a single speed and 600 watts of power, the NutriBullet is quite good for blending smoothies and emulsifying them. Though liquidify tougher vegetables and frozen fruits are not that great compare to Vitamix or Blendtex. With a maximum 3 cup capacity, it is not ideal for large batches of drinks. On the other hand, the low profile base cost the minimum spaces of your counter and is great for taking on-the-go when traveling or camping. The NutriBullet is also ideal for an RV, small kitchenette or to use at the office. The small base and minimal containers make it perfect to fit right in a desk drawer to use right at your desk. The less powerful motor also makes for quieter operation, which means you can use it in a small space or office without bothering others nearby. 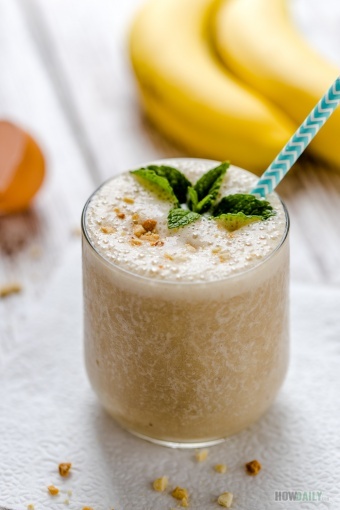 Whip up a cup of bulletproof coffee in the morning right at your desk and then whip up a quick mid-morning smoothie to tide you over until lunch. While the NutriBullet offers a single handle ring for use with one of the cups, however, it doesn’t offer a to-go lid. If you want to take a smoothie or blended drink with you, you’ll have to pour it in a separate to-go cup or take it with you lidless. On the other hand, not taking the cup with you makes it less likely you will lose the blender cup or leave it behind somewhere. If there is any blender that standing out for its ice crushing capability, it’s this Oster Reverse Crush Counterforms blender. The blending power is at 600W and combined to 1000W to cut through anything. This machine can turn any fruit, leaf veggies, frozen… to smoothie, a good one at that too. The most spectacular thing is its reversing blade feature. It helps remove air pocket formed from stubborn fruit/food chunk, turning everything uniformly. The gears are all metal, and blade is stainless steel too. So much goods for such a decent price, this Oster definitely a considerate purchase for any serious smoothie drinker with a budget. At the juncture between size, price, power and respected brand name sits the Breville BBL605XL Hemisphere Control Blender. Far less pricey than the Vitamix or Blendtec blenders, the Breville BBL605XL still offers a hefty but quiet running 750 Watt motor that will chew through the toughest of ingredients in its large 48 oz. Eastman Tritan copolyester jug. The unique hemisphere bowl and blade system actually draws the top ingredients down to the bottom of the pitcher ensuring you get the smoothest of smoothies with no leftover chunks or lumps. Final results are comparable to that of a Vitamix or Blendtec. Another plus for this Breville is its extremely quiet operation, so blending in the morning won’t wake anyone, especially useful for those who live in apartment or need the peace. An LCD Timer counts up and down for pre-programmed settings and even offers a pre-programmed smoothie setting. While it doesn’t offer the versatility of the Ninja kitchen system, Breville is still one of the most respected names in kitchen appliances that is wel-knowned for their product longevity and outstanding customer support. This is not a full capacity smoothie blender, it does possess some capabilities such as blending and pureeing. It will not however, smoothly make smoothie, but still, if you can tolerate, it does make a convenient and useful gadget for a small home kitchen. This OXA hand blender is an immersion blender. That is you just stick and immerse it directly into any pot, jar, glass or whatever you’re using. There are also some attachments included for whisking egg, chopping dry ingredients. Most of the parts are dishwasher safe, so cleaning is a breeze. So, for an apartment, travel, or small home, this machine can be considered since it could double as food processor, hand mixer, frother, etc. Included all accessories for whisking egg, chopping food, etc. If all you want is a working blender that is great at pulverizing food while looking great in your kitchen, this is it. 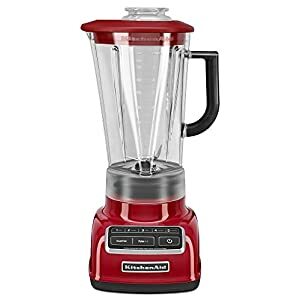 The KitchenAid diamond blender is a low to medium price range, and quite affordable for its power. Like any KitchenAid, this blender comes with over 20+ color choices, so it will surely blend in and match any modern kitchen design. A notable feature is the soft start, which allows food to be pulled down to the bottom before any blending. This help in minimizing air pockets and such in smoothies. 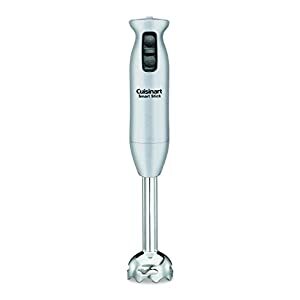 This is a low price, if not the cheapest, among hand blender. It’s just very basic immersion blender, and only equip with 200W. Despite that, it can puree fruit and veggies just fine, crushing ice somewhat. Making soup through pureeing and mixing directly in stock pot was convenient. Not much to clean up, and most parts can be throw into dishwasher. A very convenient tool to have in small kitchen or while traveling. Can be used for smoothie, ice crush, light mixing, mayo, dipping, etc. When it comes to buying a blender, there are a great number of different options to choose from, depending on what you are using it for. There is no one-size-fits-all best smoothie blender for everyone. For instance, if you just want a cup of smoothie every morning or after workout, you may want a simpler yet powerful convenient single-serve blender. If you want a blender that will make smoothies as well as offering other options such as chopping, slicing, dicing and blending other types of drinks, you may want a more versatile blender with a number of attachments. On the other hand, larger blenders take up more counter space and the attachments take up cupboard space. 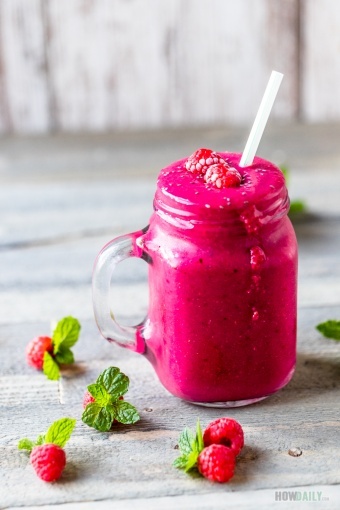 If you live in an apartment or small space, you may want a smaller, quieter blender, while if you live in a larger home or making smoothie for many, you may want a larger, more powerful blender. Not all blenders are built the same. Professional blenders have more commercial quality parts and design to crush through everything. Though, they are often more bulky and cost more, typically $300 to anywhere above $800. So unless you have a large budget and dedicate counter space with a really serious blending need, these might not work as well for your case otherwise. A more affordable solution is the mid range blenders. 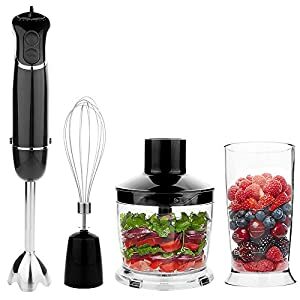 These tend to provide great quality smoothies and frozen treats, some even come with extra gears that serve as well as a food processor, whisk, or dough mixer. If you live in small space and don’t want to spend too much, consider an immersion blender. It definitely doesn’t produce as good smoothies; however, it can double up as hand mixer, whisk, froth, and puree just fine. Most of the usable hand blender cost less and take even less space to store, very convenient too. So, it’s all depend on whether you simply want to fast blend smoothies for yourself or for the whole family; blend for on-the-go or a relax afternoon; what you need to blend, e.g . 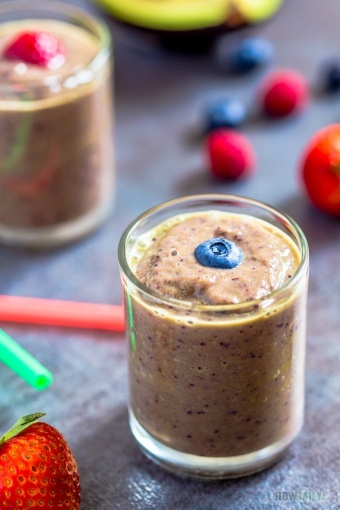 frozen food, raw nut butter, leaves veggies or simple fruits… all of that would give a different types of blender picture. Some people may want to have more than one blender as well. 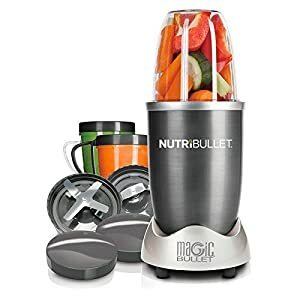 For home use, you may want a Ninja Mega Kitchen System and for less than $100, you can also get a NutriBullet to keep in your desk drawer at the office. In other cases, you may want to keep a NutriBullet out on the counter at home for quick smoothies in the morning and a larger Breville BBL605XL tucked away for larger events or when you want to whip up a batch of soup or jam. If you’re using blender once/twice a day, longevity is the key. Any more than that will depend on your budget too, since you might go into the flour, butter, bread direction, consider a Vitamix or Blendtec at a hefty fortune. Anyhow, the best blender is the one that you’re actually using. Whatever your needs, there is a best kitchen blender or smoothie maker for you at just the right price point. 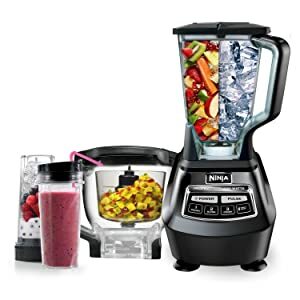 We hope these smoothie blender reviews have provided the best information to help guide you to finding the best personal blender for you.